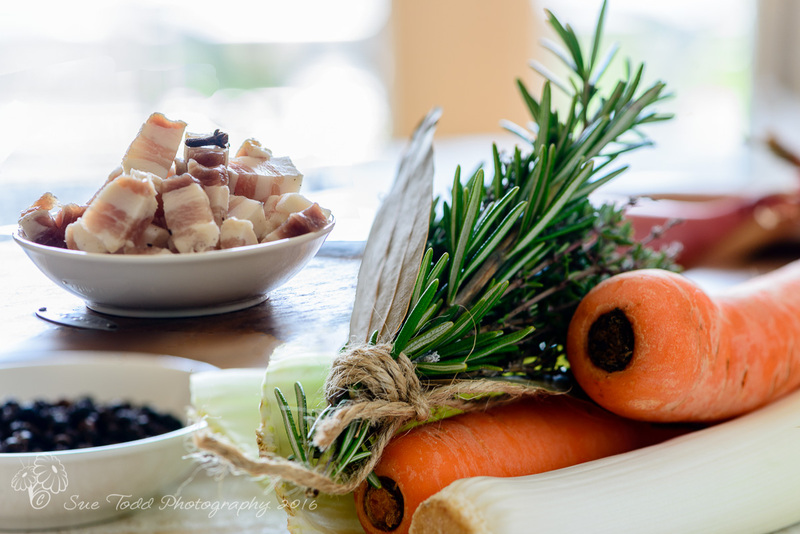 Real Food and Photography from our English Country Kitchen. A collection of our favourite recipes. I’ve been almost totally gluten free since May 2017. There have been a few exceptions which haven’t ended well especially of late. I stopped eating gluten because I was having some massive skin reactions which so far they can’t account for. It has settled down, I feel so much better and now if I do put gluten in I not only get itchy skin, I get a really upset tummy. Interestingly despite always loving bread, and craving it when I first couldn’t have it, I now don’t care for it much. On the odd occasion I do have some ‘if’ its good bread, like made on the premises or at home then I do really enjoy it. Bought bread?? NOPE, can no longer cope with it. Totally lost the love. If I do sample I’m always really, really disappointed. But overall I count that as a good thing. But Yorkshire Puddings! How can life be without them? I have to admit I do love a roast dinner. It can be lentil loaf, actually I adore a lentil loaf. But without Yorkshires and at least a couple of roasties I do struggle. Going out for Sunday lunch is tricky because while a lot of places now cater really well for gluten free they do not make gluten free Yorkshire Puddings. BUT they are so easy and actually we now prefer them …. So here you go. Using arrowroot means they are also grain free which is fab. Oh and yes you can have a go at them with gluten free flour but we find it doesn’t work so well they don’t rise greatly and they just aren’t the same. Besides which I’m still toying with the idea of going grain free so that’s not going to help much. The answer it seems is arrowroot. Don’t buy it in the supermarket though as its hugely expensive for a tiny sachet of the stuff. Go to a health food store instead where you’ll be able to buy in 500g packets. 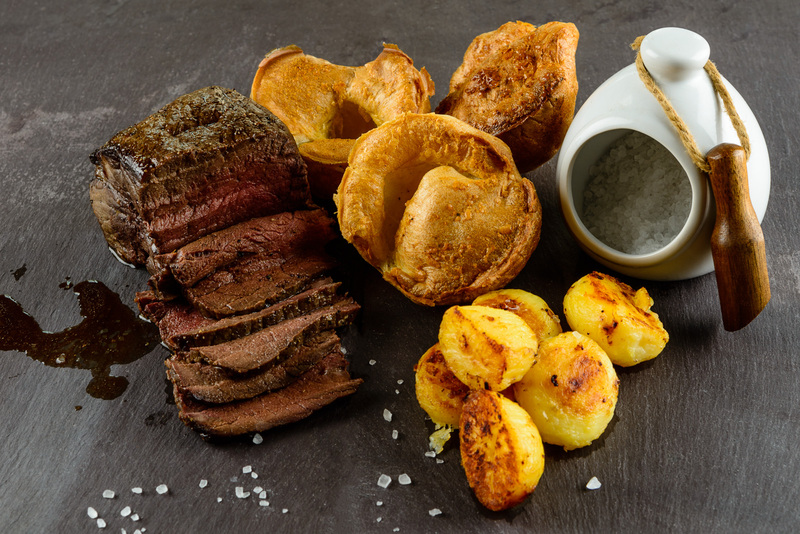 We’ve found that it gives the most fantastic Yorkshire puddings that rise beautifully, taste great and don’t collapse on leaving the oven. oil, lard or dripping for the tins. With a conventional oven you’ll need to preheat 230C/fan 210C/gas 8. 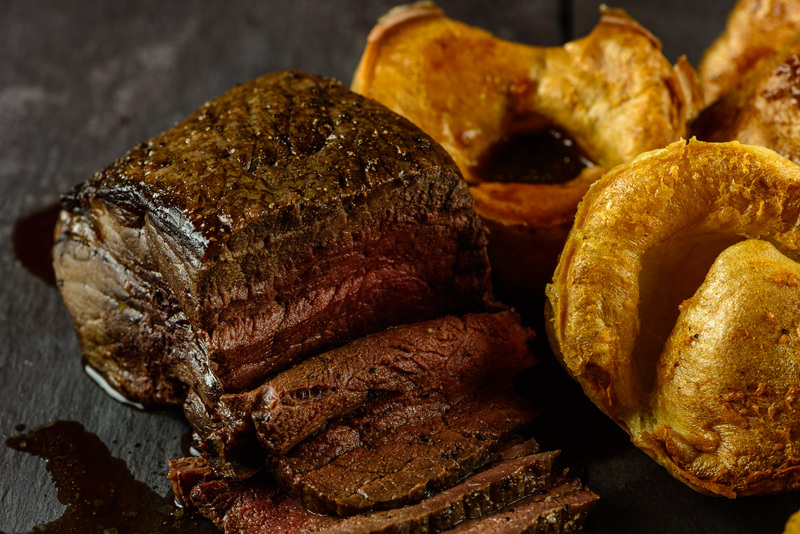 Put a drizzle of oil or a smear of lard/dripping in each tin of your Yorkshire Pudding and pop it into the oven to heat the oil through until its smoking hot. Add the eggs to a bowl with the arrowroot and whisk to blend in. Add a good pinch of salt and whisk again. Then add the milk slowly to make a batter, mixing all the time to avoid lumps and keep mixing until the batter is smooth. If you’ve not used a jug, transfer it into a jug now as it makes pouring so much easier. Leave it to rest. You can make this in advance and let it stand until you are ready. Heat a teaspoon of oil in each well of a pudding tray until smoking hot. After about 30 minutes, remove the hot tin carefully from the oven and put on a heat resistant surface. Carefully and evenly pour the batter into the tin and place in the hot oven for about 25 mins. Your Yorkshire Puddings should be all golden brown and beautifully risen. Remove from the oven and serve. Enjoy!! This entry was posted in Food, Gluten Free, Grain Free, Salads on January 21, 2018 by Sue Todd. Gary made these for me this week and it was a great hit, so much so we have it on the menu again this week. I know some people hate the idea of fruit and meat together but I rather like it. The chicken and pineapple work really well together and you get a really good dose of fruit and veggies with this one, especially if you opt for cauliflower rice. What more can I say, give it a whirl and let me know what you think? 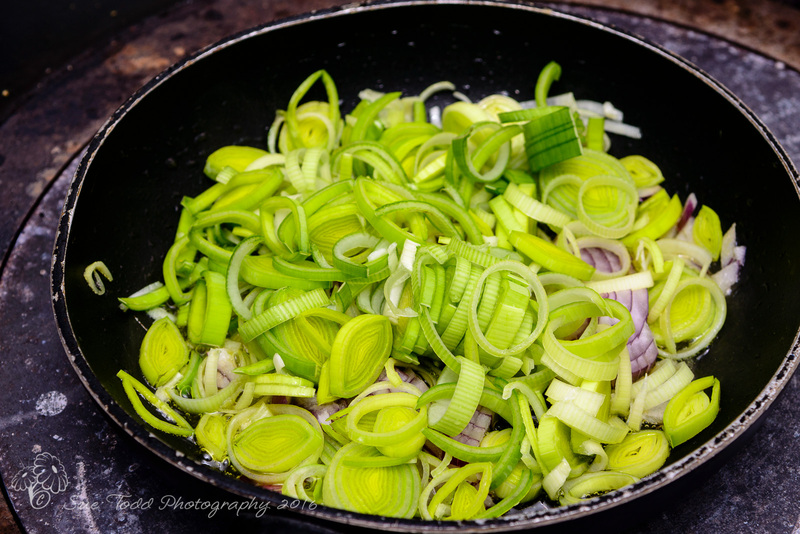 Splash of oil to fry the onion off. Take a heavy based pan and put a splash of oil in, put on the heat and then fry the onion until it’s transparent. Add the wet ingredients then the dry ingredients and stir well. Simmer for 20 minutes stirring from time to time until the sauce has reduced and is thick. Set to one side while you prepare the chicken. Cut the chicken breasts into bite-sized pieces and drop into the sauce. Leave to marinate for two hours. If you are using a conventional oven pre-heat to 200C/Gas 6. Chop the onion, pepper, pineapple and pepper in into large chunks, for threading onto the skewers. Skewer the chicken with pieces of red onion, mushroom, Pineapple and red pepper, taking each in turn over 4 skewers (2 per person). Lay the skewers out on a flat baking try and cover with the remaining BBQ sauce. Place in the roasting oven of the AGA ( or for conventional ovens use 200C/Gas 6) until the chicken is cooked through. Serve on a bed of rice or cauliflower rice. I love cauliflower rice and am avoiding grains again at the moment so that was what I went for. You could use other meats or even fish in this. This entry was posted in Grain Free, Meals, Recipes and tagged Chicken, Grain Free, Pineapple, we're on January 8, 2017 by Sue Todd. Having been really, really ill after eating prawns one evening many years ago, I’ve been along time coming round to eating them again, but I do adore salmon so this was the recipe that got me back to eating prawns once more. This is really fast to do and makes a really light but impressive dish in a hurry. Put the oven on to heat. Cut the salmon into 2.5cm cubes, then skewer the cubes of salmon alternatively with king prawns. Melt the butter in a pan and crush two cloves of garlic into it, season with salt and pepper. Place the kebabs in a shallow dish and cover with the melted butter. Roast in the oven until the fish is just cooked – it took 10 minutes in the roasting oven of the AGA. Either take the dish to the table to serve or transfer to plates. Sprinkle with fresh parsley and serve with a cob salad, french bread and a good chilled Sancerre. This entry was posted in Fish, Recipes and tagged Fish, Kebabs on December 7, 2016 by Sue Todd. 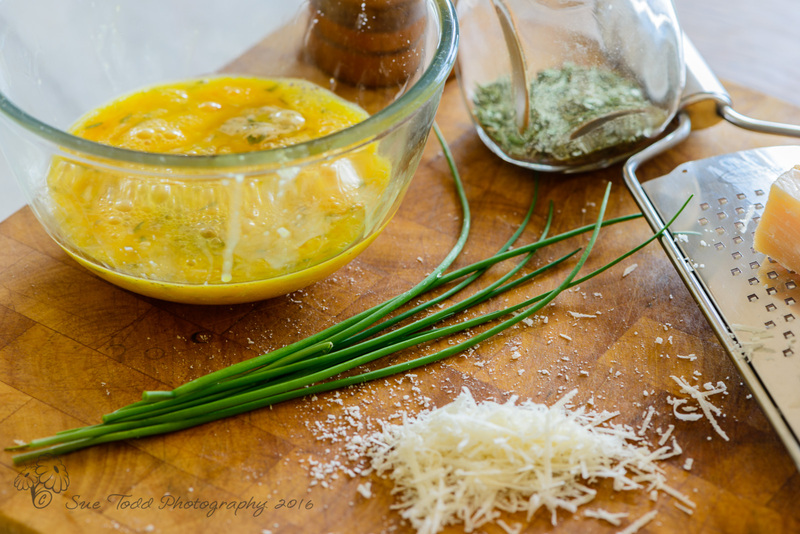 Tarragon omelette has become one of our regular go-to recipes this year. It’s simple, fast and delicious. It makes an elegant lunch or a delightful breakfast, looks good and tastes even better. As we come up to the busiest time of the year with a nice salad and a glass of wine it makes a fast and delicious supper on a busy evening when you are too tired to do very much but you want something wholesome and not fast food. Melt some butter in a pan and add the eggs. Using a wooden spoon pull the cooking eggs in from the rim of the pan to the middle. leave for a couple of mins for the inside to finish cooking. garnish with chives. For a lovely light lunch serve your tarragon omelette with a green salad and a glass of good red wine. However, this could work equally well for breakfast served with tomatoes and fresh orange juice or coffee to drink. This entry was posted in Breakfast, Meals, Recipes and tagged Eggs, Omelette on November 29, 2016 by Sue Todd. 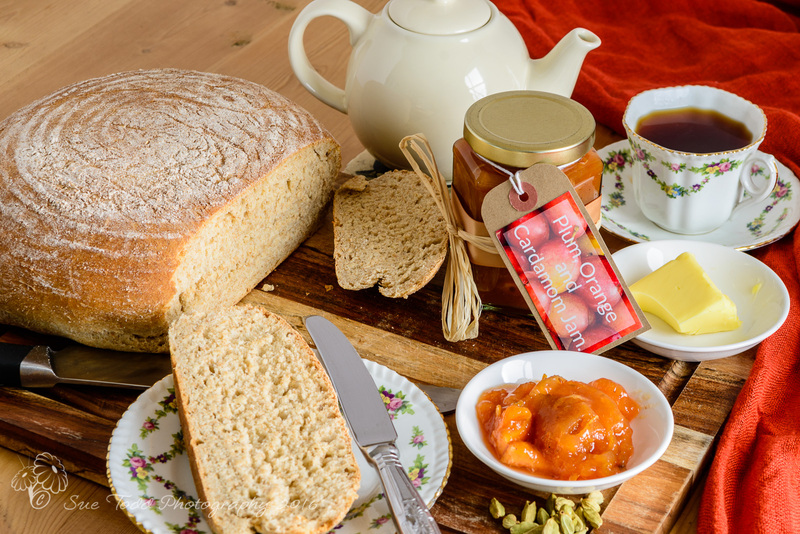 We call this plum, orange and cardamom jam, ‘Christmas Jam’ and if you make it you’ll understand why. We first made this last autumn in late September and the whole house smelt of Christmas in the most fabulous way. So if you have plums in the freezer get them out and give this a whirl. This recipe is one of Diana Henry’s in a lovely book called ‘salt sugar smoke’ and it is all about preserving fruit, vegetables, meat and fish. We’ve not used it anywhere near enough yet but this recipe is just wonderful. Marmalade is great on toast but this jam is possibly way better and of course, there’s also the smell, did I mention the smell? I’d love to bottle the smell of this cooking. Before you start, put your jam pots to warm ready for the jam when its done. Start by slicing your oranges into really thin slices, removing any seeds as you go. Cut the slices into quarters and pop them in a pan with 150ml (5fl oz) of water. Bring the oranges and water to the boil, then reduce the heat, add a lid and cook the orange quarters for about 20 minutes until they are soft. The idea is to have the same amount of fluid at the end that you started out with so you may need to add a drop more. While the orange is cooking, chop the plums in half, removing the stones and cut them up into slices too. Put the plums into a preserving pan along with the oranges and water, the orange juice, half of the lime juice, and the ground cardamom. Bring the mixture up to the boil. Once it’s reached boiling point, lower the heat and simmer gently until the plums are soft – about 15-20 minutes. 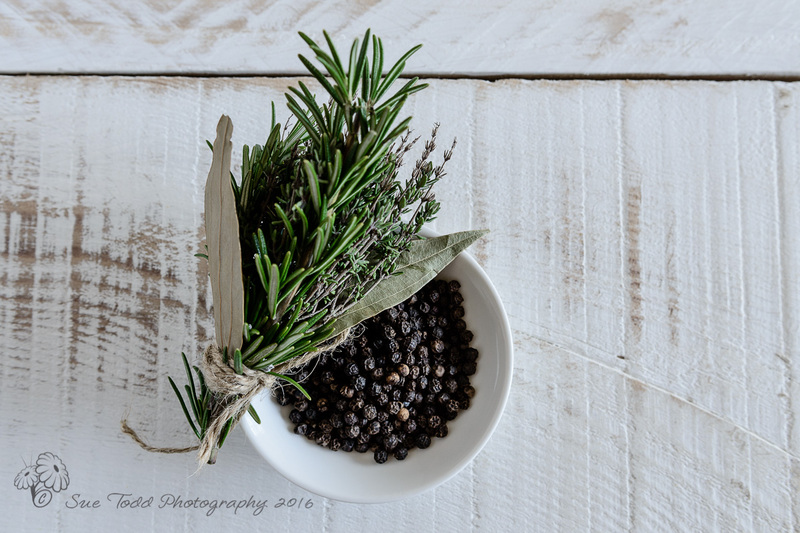 The kitchen will now smell delicious and it will begin to permeate through the house – enjoy. Now add the sugar and simmer gently stirring all the time to dissolve the sugar. When the sugar has all dissolved, bring the mixture to the boil and keep it at a boil until it reaches setting point. I use a thermometer but also the old-fashioned wrinkle test. Once it’s reached setting point remove from the heat, skimming of any scum from the top before adding the last of the lime juice. Pot up the jam into dry sterile jars, cover and seal. This jam needs to be refrigerated once you open it but keeps well in the larder for up to a year – if you can manage to leave it alone that long. Then just enjoy! Especially enjoy the smell of Christmas each time you take the lid off. This would make a lovely gift for Christmas too. 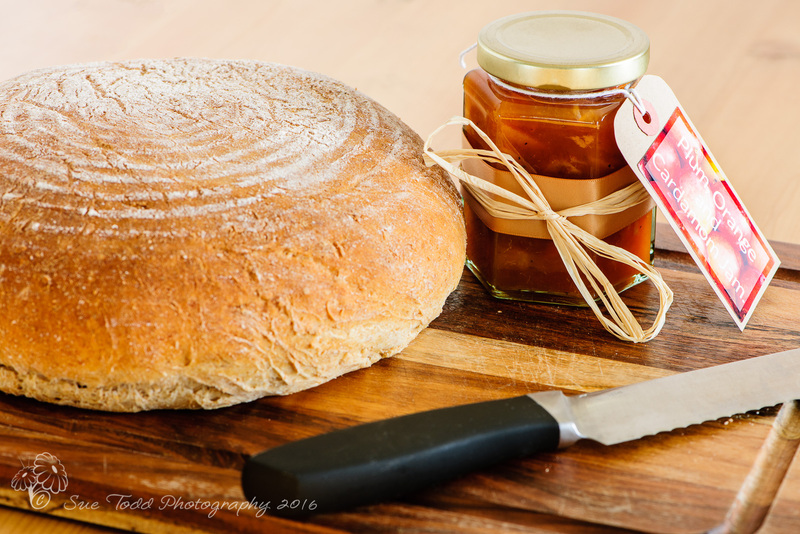 This entry was posted in Preserves and tagged Jam, Preserves on November 22, 2016 by Sue Todd. I’ve been enjoying smoothies for breakfast regularly over the summer but now the shorter days are back I’m looking for something warmer that feels more substantial, and that’s where roast vegetables come in. Really quick and easy to do and you can make as little or as much as you like so there’s some for another day or to use up for lunch. (Added 16/11/2016) – Of course as the lovely Eileen points out on our Facebook page (do come and join us there!) you can use any vegetables you happen to have for this, carrots, swede, parsnip, beetroot, celery, celeriac. It’s nice to ring the changes and some times you just have to go with what the fridge and the larder can offer up. Experiment and enjoy! Roast Veggies ready for the oven. 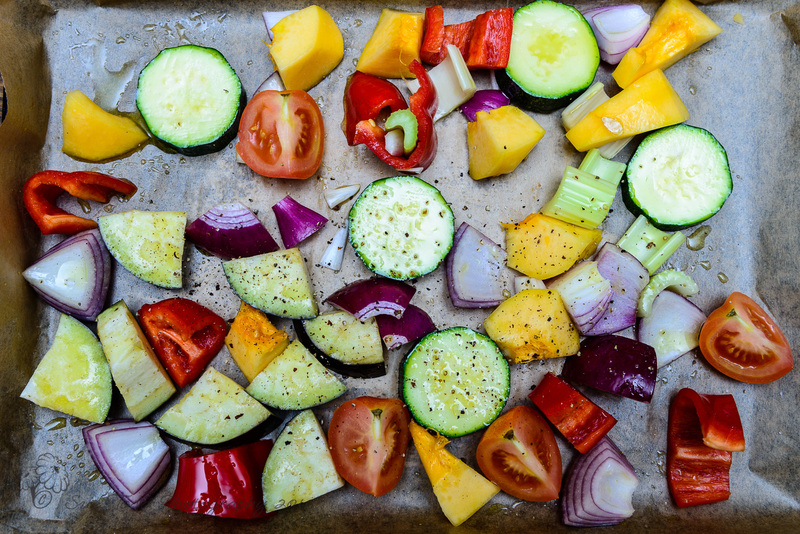 A mix of vegetables, I used celery, peppers, squash, red onion, tomato, aubergine and courgette. Olive Oil and seasoning to taste. Chop your vegetables into chunks. 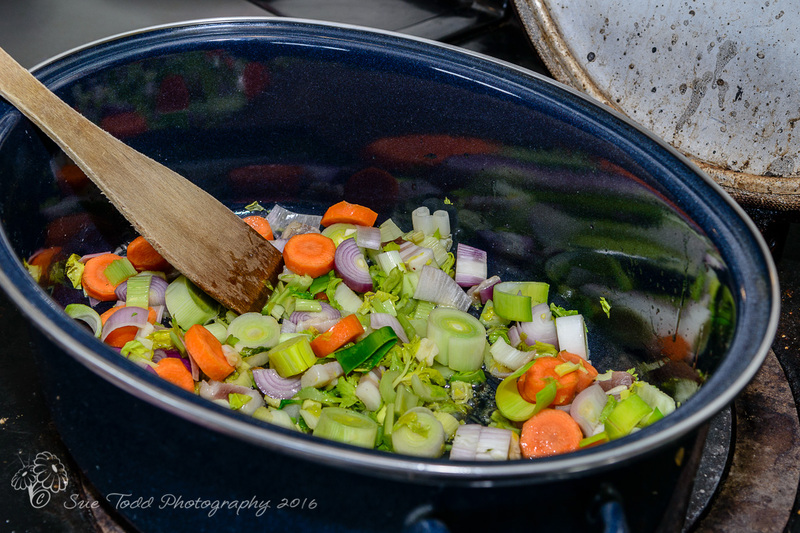 Line a shallow tray with greaseproof paper and put the chopped vegetables on top. I like to use greaseproof as it stops the oil burning onto the tray. Drizzle with olive oil and season to taste. 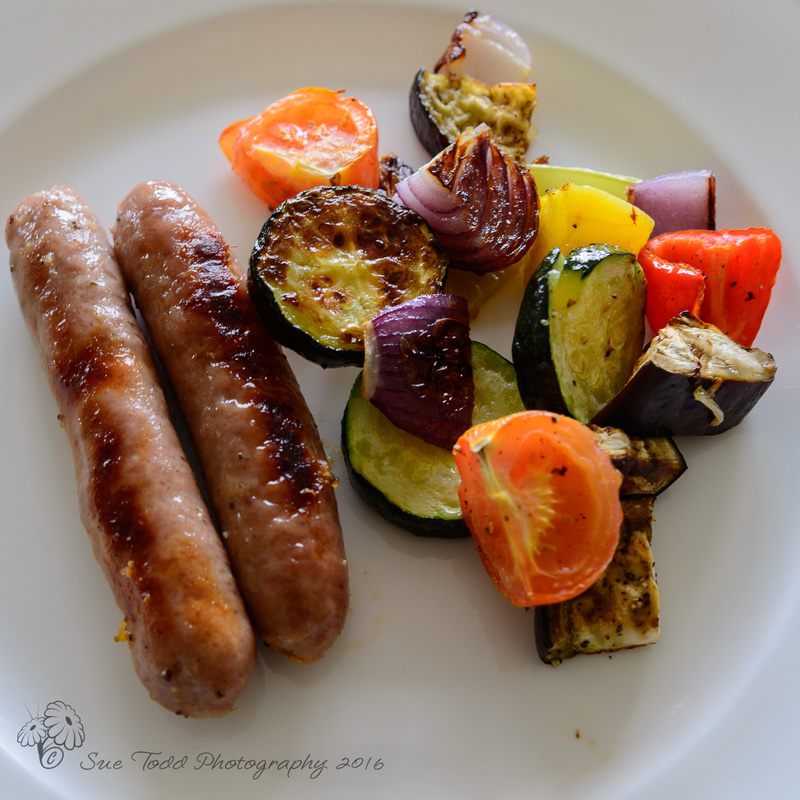 You can add bacon or sausages to the same tray to cook – you may not need so much oil then. Pop in the oven until cooked – about 15 to 20 mins. Serve with bacon or sausages and add some eggs if you want a bit more. 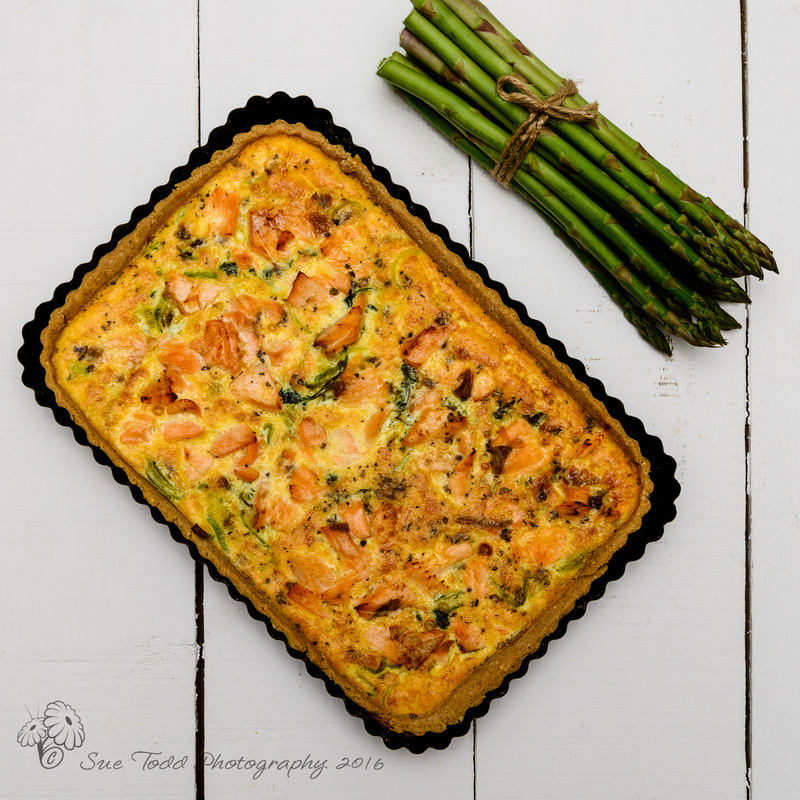 This entry was posted in Breakfast, Recipes, Veggie and tagged Breakfast, Vegetables on November 15, 2016 by Sue Todd. Some foods are an acquired taste, and we all have things we love and hate in equal measures. It has taken me my entire life to get around to being able to cope with ‘trying’ mussels. There’s just something about them, and oysters that just leaves me cold. BUT …. mussels look so attractive when being served and I was desperate to photograph them, so it seemed rather stupid not to eat them too. I bought into the whole experience, the table was set, the smell, the colours the tastes – I was actually really looking forward to them. The mussels, however, didn’t really do it for me, I have to say. I could eat them but I don’t particularly like or love them. I think its the texture but I’m not saying I won’t try them again, because you have to try new things right? That’s what I always told my boys and sometimes you just love the results. My boys love this dish, I guess I may get there one day. With a bottle of wine on a relaxed evening with a loved one or friends it just is such a lovely sharing dish to put on the table, so I’m thinking I must try again. 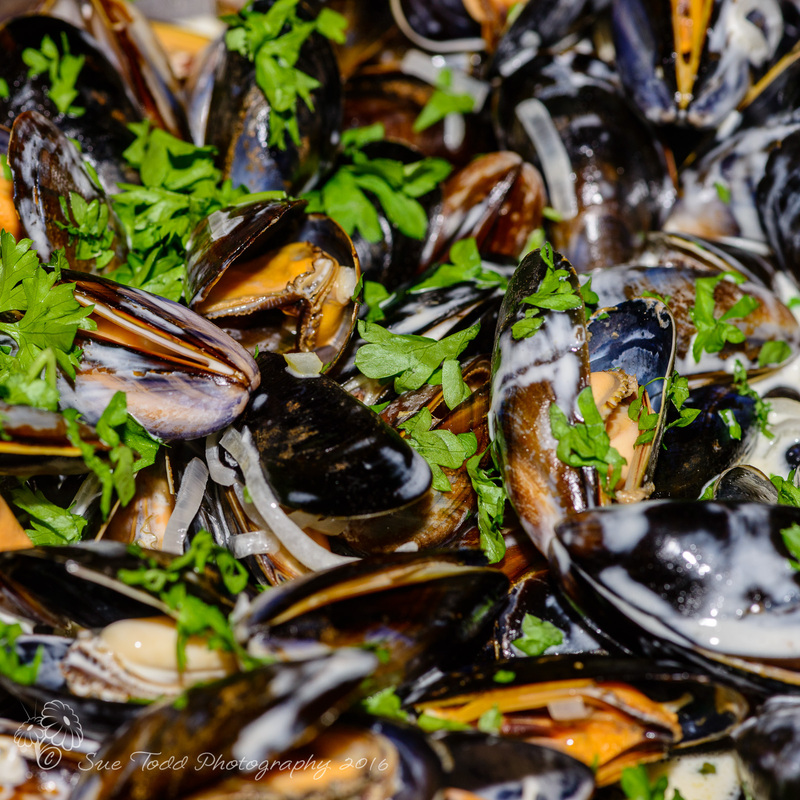 Wash the mussels carefully under cold, running water. Throw away any open ones which won’t close when you squeeze them lightly. Remove any tough or fibrous bits sticking out of the shells and knock off any barnacles. Then rinse them well again to remove any little pieces of shell. Melt the butter in a large heavy-based pan and add the garlic and shallots together with the bouquet garni and sauté them off until soft. You’ll need to make sure the pan is a big one with enough space for the shells to open during cooking. Next add the mussels together with the wine or cider, increase the heat and steam the mussels in their own juices for 3-4 minutes until they open, giving the pan a good shake every now and then. Remove the bouquet garni, then add the cream and your chopped parsley, lifting the pan from the heat as you do. Spoon into individual bowls or simply take the pan and a serving spoon to the table and let people help themselves. Serve with crusty bread, chips or saute potatoes. This entry was posted in Food, Recipes, Shellfish and tagged mussels, Shellfish on September 7, 2016 by Sue Todd. Generally as summer approaches and the days get warmer my thoughts turn even more to salads and summer foods. Sadly this year the weather isn’t helping much, and is more suggestive of casseroles and stews than salads but we live in hope and meanwhile here’s a lovely summery tart to enjoy whatever the weather. 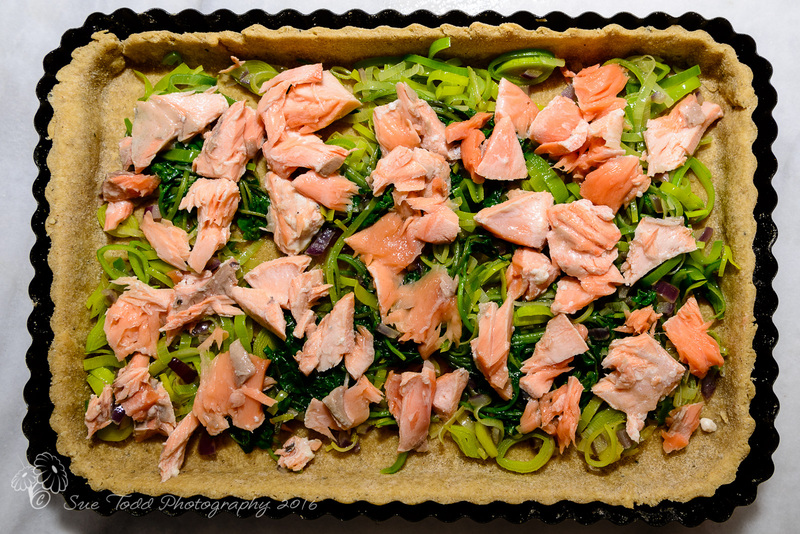 There’s quite a few recipes for salmon tart around and they all seem to use masses more salmon than I did, but actually this was enough and gave us eight portions of tart. Can you call pastry, pastry if it doesn’t use wheat flour? Just a pointless thought, excuse me. I didn’t have any buckwheat flour which is what I’d intended to use, when I set out to make this but didn’t want to use wheat flour, so I’ve used rice flour but next time I’ll swap that out too. Its fun to experiment and its rare that things are inedible, though it can happen, so feel free to experiment too. If you like doing things the old-fashioned way then tip the flours, xanthan gum and salt into a bowl and rub it together until you have a crumb like structure. Of if you have hands like mine that can no longer manage that stick it all in the stand mixer with the k-beater and mix on low-speed until you have crumbs. It’s much faster and while its more washing up you can do other things while its mixing. On the Kitchen Aid I use speed 2. Add the egg and mix up again. Next start adding water, and mix until the dough begins to form a ball. Don’t be tempted to put less water in just because it seems to come together with the egg, it won’t stay together – as I found, it really does need a good bit of moisture. Chill for an hour before using. If you’re using a conventional oven pre-heat it to 400F. Butter your tart tin in readiness. 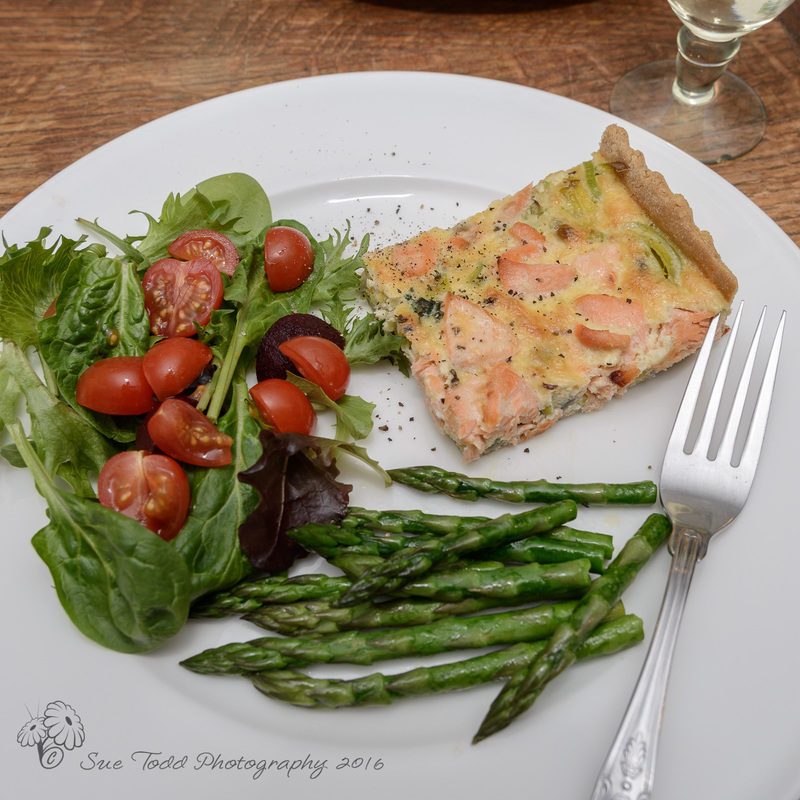 Poaching Salmon © Sue Todd Photography 2016. Check over the watercress and give it a good wash. Dry it using a clean tea towel or salad spinner. Wilt the watercress in a saucepan in the four tablespoons of water. For about 3 minutes, stirring gently, then remove from the heat. Squeeze the watercress gently to remove excess water and chop it finely before setting to one side for a moment. Put 3/4 of the cup of milk into a heavy based frying or sauté pan along with your bay leaf and salt and pepper to taste (as in a pinch of each). 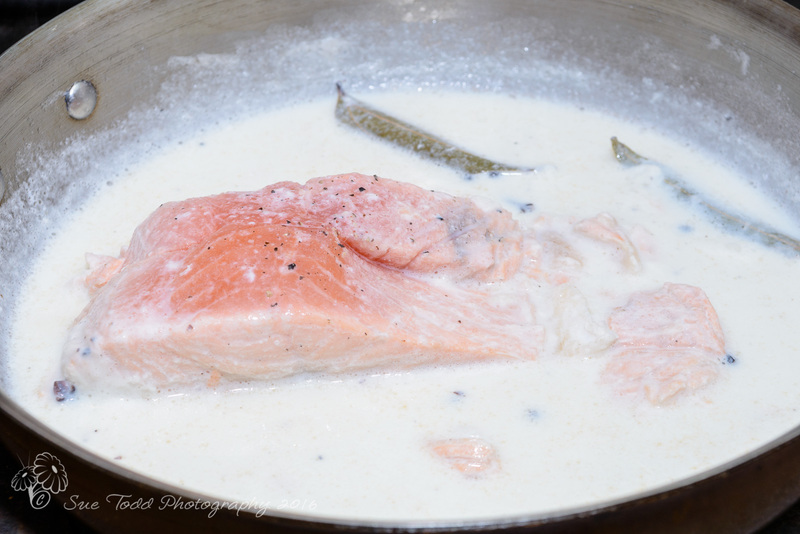 Heat the milk through and when it starts to simmer add the salmon and poach it for around 3-4 minutes. Remove from the heat and leave it for around 10 minutes so that the flavours infuse, then lift the salmon out of the milk. Don’t discard the cooking liquid, we’re going to use it. Drain the salmon carefully and crumble on to a plate or chopping board and put to one side. Do watch for bones. Strain the milk mixture through a sieve and measure out 1/4 cup of it to add to a bowl with the eggs and cream. Season with salt and pepper to taste and add the freshly grated nutmeg and herbs. Empty the pan you used for the spinach and add about 2 tablespoons of oil to it and heat through before popping in the leeks and shallot. Cook without browning until they are soft, about 5 minutes or so. Flour a board or counter top and roll the pastry out gently to fit your flan or tart case. Lift the pastry gently and fit into the tin or dish. Cut the edges back to fit and prick the bottom of the pastry case with a fork. Take a sheet of greaseproof paper or baking parchment, wet it under the cold tap and crumple well. Straighten it out and line the pastry case with the damp paper. Tip in baking beans and pop your pastry case into the oven to prebake for about 10 minutes. I used the baking oven of the AGA for mine. Remove the tart base from the oven and lift out the baking beans. I remember the first time I ever used these I omitted the parchment – what a time I had removing those beans and leaving the pastry intact! I always have a bowl on hand to tip them into to cool. Pop the pastry case back into the oven for a a further five minutes. Next add the leeks and shallot, then the watercress and finally the salmon before pouring over the egg mix you prepared earlier. 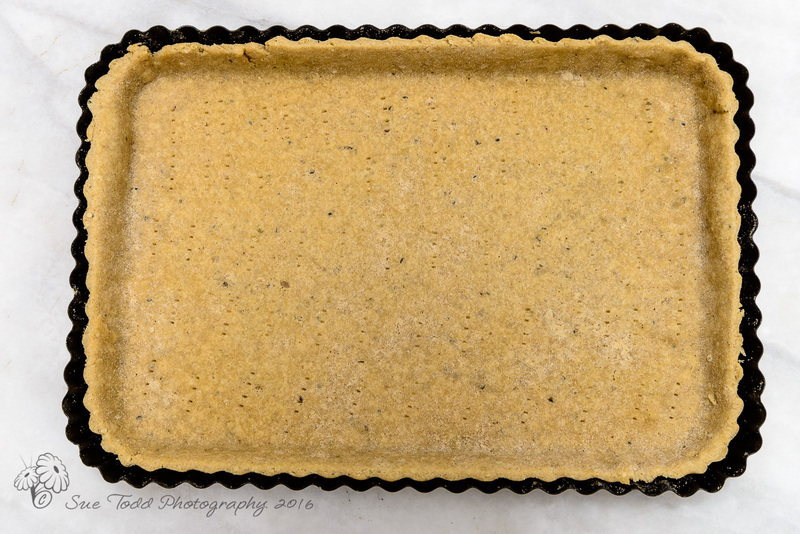 The tart now needs to bake for around 30 to 35 minutes until the top is lightly golden and the tart has set nicely. If you decide to use individual tart tins or dishes then reduce the cooking time to about 20 minutes. Let the tart sit for about 10 minutes before serving. Lovely served with salad, any leftover tart is great the next day. Serve hot or cold. 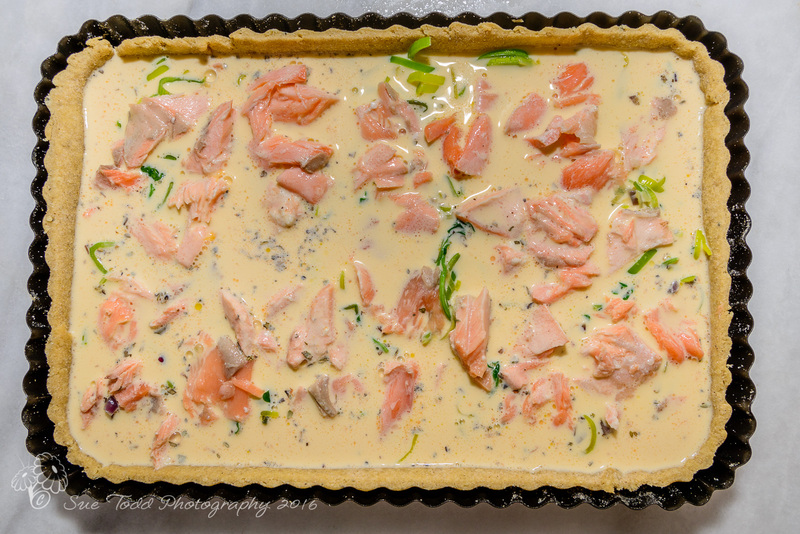 This entry was posted in Baking, Fish, Food, Recipes and tagged Salmon, Salmon and Watercress Tart, Tart, Watercress on June 9, 2016 by Sue Todd. We’ve been making stock from bones in the English Country Cooking Kitchen for years, but suddenly “Bone Broth” is a big thing, if not the thing. So I guess we’re a bit late adding it to the blog, but whatever you call it, its pretty good stuff and way better for you than anything out of a packet, regardless of whatever the packet may try to suggest. Beef Bones, we used 3 beef short ribs with some meat left on. butter and a splash of olive oil or beef fat for frying. 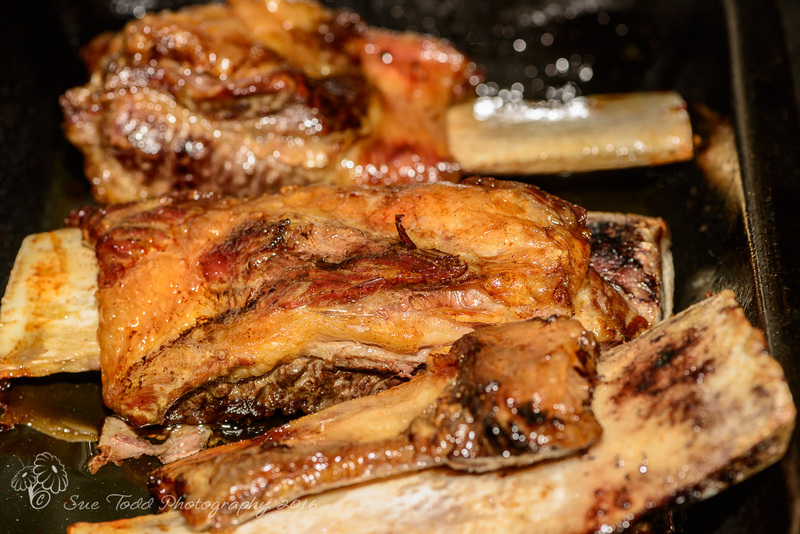 Roast the beef bones until the meat has receded along the bone, pour off the rendered fat and then allow to cool. I use the roasting oven of the AGA. If you are using a conventional oven you might want to put these in at the same time you are doing a roast to make it more cost efficient. Chop all the vegetables and fry in the butter or oil/fat until soft and starting to turn golden. Add the water, bones, and the rest of the ingredients together and bring to the boil. Cover and place in the simmering oven of the AGA for at least six hours and up to 12 hours, checking now and then to make sure the water level is ok and to skim off any froth that may form on the top. You could also use a slow cooker for this, but check cooking times/controls with the manual. Then strain out the liquid and discard the veg and bones etc. 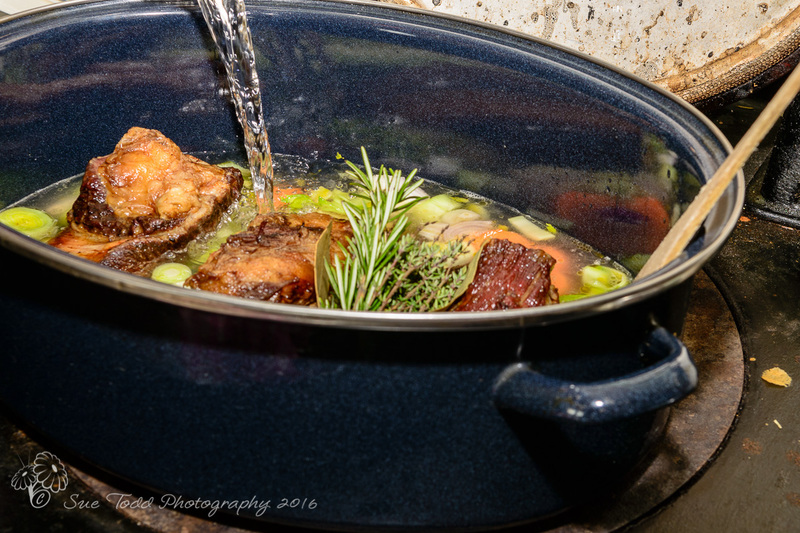 Allow the stock to cool over night and then lift of any fat that may have set on the top. Don’t forget you can re-use the fat for cooking with, so don’t discard that. The stock is them ready to use. If you don’t need it all at once it will freeze perfectly. 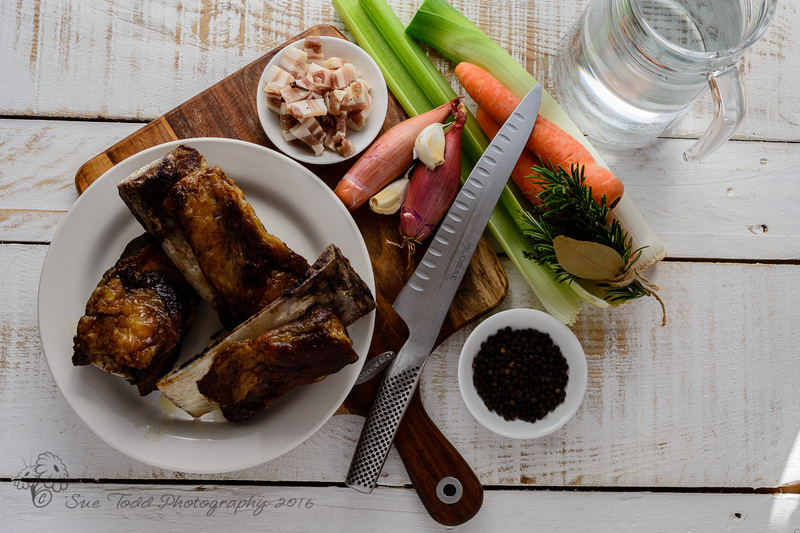 You don’t have to use beef bones you can make bone broth with any bones you happen to have. We regularly tip the remains of the roast chicken from a Sunday roast into the pan to make broth, which then goes into soups, risotto etc. For more standard stock recipes, Fish, Game, Veg, Chicken and Veal etc, check Practical Professional Cookery by Cracknell & Kaufmann. As the name suggests these are professional recipes and produce much more stock that you would need but you can amend the quantities down to suit. This entry was posted in Food, Recipes, Stock and tagged Bone Broth on May 17, 2016 by Sue Todd. Despite the weather not being what you might term spring like here in Northumberland, we’re trying to move towards smoothies for breakfast at least a few times a week. 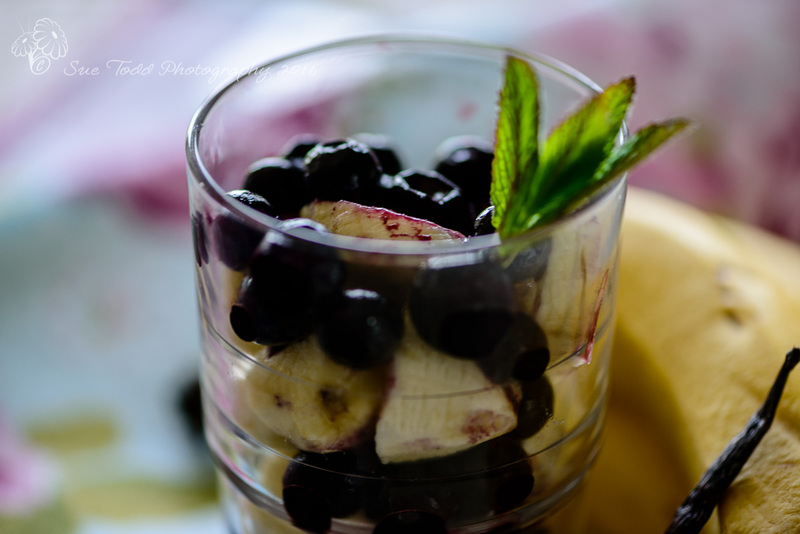 This blueberry and banana smoothie is one of our favourites. I’d just like a big dose of warm sunshine to go with it so that we could enjoy it in the garden. Smoothies are really fast, and if you whizz some warm water and dish washing liquid up in the blender/processor after use then cleaning up is minimal. Add all the ingredients except the coconut water to a blender or food processor until mixed thoroughly and no lumps of fruit remain. Then slowly add coconut water and blend again (without forgetting to shut the lid first – unless you are partial to cleaning in a big way!) until it’s a consistency you like. We like ours fairly thick but still drinkable, although I’m playing with the idea of a much thicker smoothie to go with home-made granola. If you have a sweet tooth (like Gary!) then you can add a dash of maple syrup to sweeten things up a little or honey if you prefer. Oooh! And before I forget if you any leftovers, freeze it as ice pops (remember them??) for the summer which we’re hoping will arrive at some point. They make lovely treats on hot days. 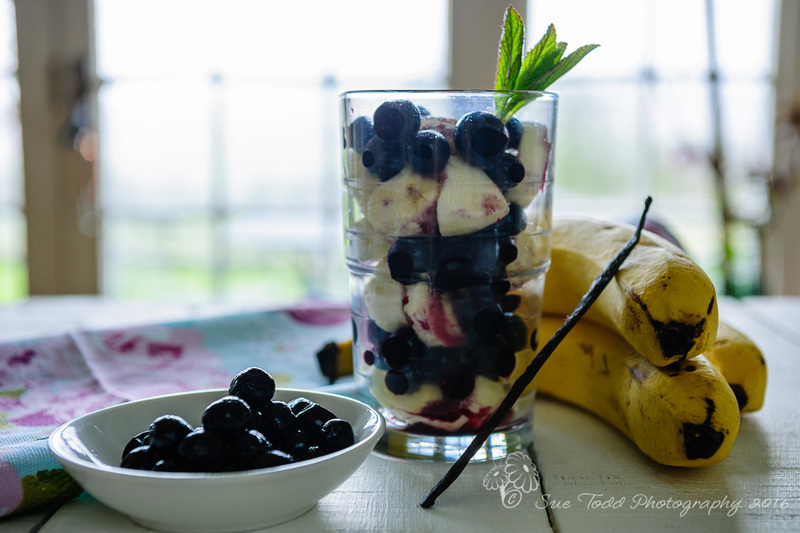 This entry was posted in Breakfast, Food, Recipes, Smoothies and tagged Breakfast, Fruit, Smoothie on May 2, 2016 by Sue Todd. English Country Cooking is a participant in the Amazon EU Associates Programme, an affiliate advertising programme designed to provide a means for sites to earn advertising fees by advertising and linking to Amazon.co.uk.